In collaboration with the CREATE Lab, we created a data flyer summarizing the trends of gentrification and the negative social impact of the consent order negotiated between the City of Pittsburgh, the company that owns the land where the Penn Plaza apartments once stood (LG Realty), and various neighborhood development groups in surrounding areas. The latest flyer can be downloaded as a PDF here. 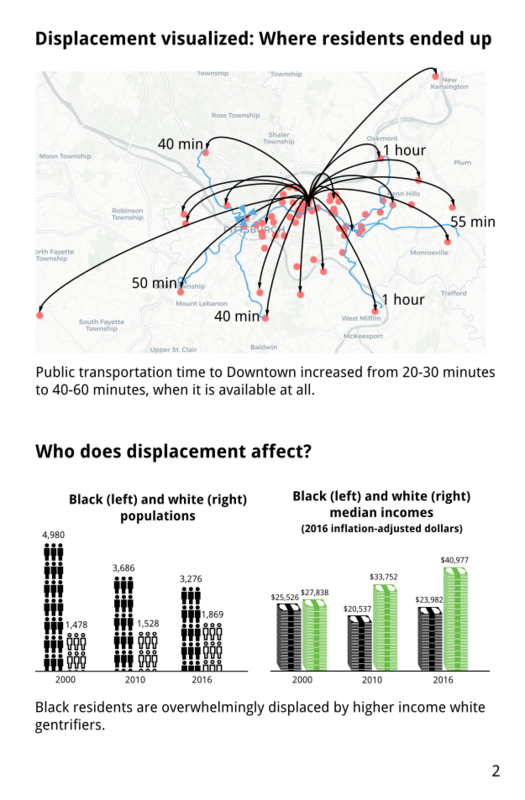 The data used on page 2 of the flyer -- where former Penn Plaza residents have ended up and typical travel times to downtown via public transportation -- were collected by members of CREATE Lab. Data on the demographics, median income, units of housing, and rent in East Liberty (used on pages 2 and 3 of the flyer) are taken from 2000 and 2010 census data and from 2016 five-year estimates of American Community Survey (ACS) data. Census data is highly accurate but only taken every ten years. ACS data is collected every year, but it only coarsely samples the population. In order to describe the population of a small neighborhood like East Liberty with reasonable accuracy, five years of data must be aggregated. Therefore, unlike the 2000 and 2010 data, which are snapshots of what the neighborhood was like in those years, the 2016 data is an estimate of East Liberty during the period of time from 2012 to 2016. Social Explorer was used to search the census databases. The latest version of the flyer displays all monetary measures (income and rent) in 2016 inflation-adjusted dollars. Median income and rent by neighborhood (used on page 4 of the flyer) are taken from this City-Data.com page. The median rents by neighborhood match the 2016 five-year ACS estimates. The median incomes by neighborhood do not exactly match the ACS data but are close. The consent order negotiated between the city, LG Realty, and various neighborhood development groups requires money to be set aside to fund developers seeking to acquire or create mixed-income housing within one mile of the old Penn Plaza apartments (Section 6.1.8, pp. 4-5). Exhibit D (p. 11) lays out guidelines about these housing projects. It specifies that developers are eligible for funding if they create housing affordable to people making 80% of the median household income. This definition is similar to the definition of affordable housing used by the U.S. Department of Housing and Urban Development (HUD), which uses 80% of area median income (AMI), a measure that would take the median income across the Pittsburgh metro area. However, one mile from the Penn Plaza apartments (and the Pittsburgh metro area) encompasses a broad array of neighborhoods. Our flyer displays what affordable rent (roughly one-third of one's income) would be at 80% of the median income for various neighborhoods and for Pittsburgh as a whole. As the map indicates, these monthly rents are far beyond the budget of low-income people. Not only that, but these funds can be easily funneled into housing projects in richer neighborhoods near East Liberty that are well beyond the budgets of most Pittsbughers. Affordable housing advocates recommend using the level of 30-50% AMI as a measure of true affordability. 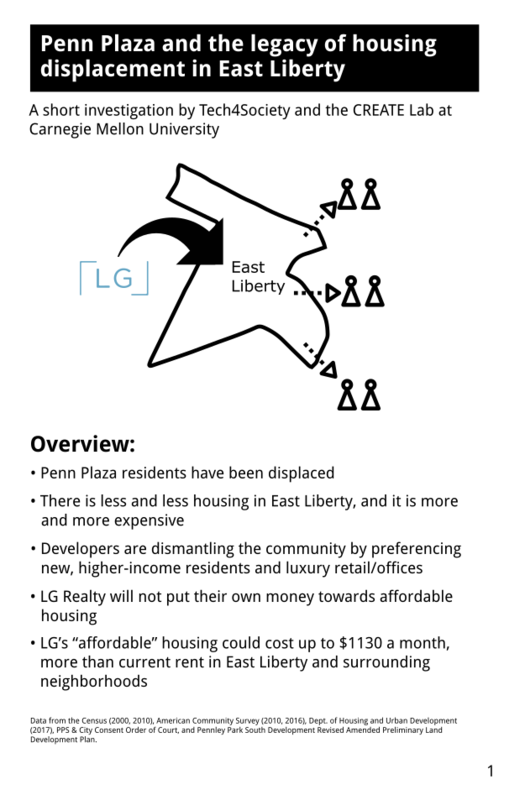 Our flyer highlights major issues with the consent order and LG Realty's development plan. The negative social impact of gentrification in East Liberty is severe. Black people are being disproportionately displaced from the neighborhood, and rich entrants are being prioritized over poorer residents. 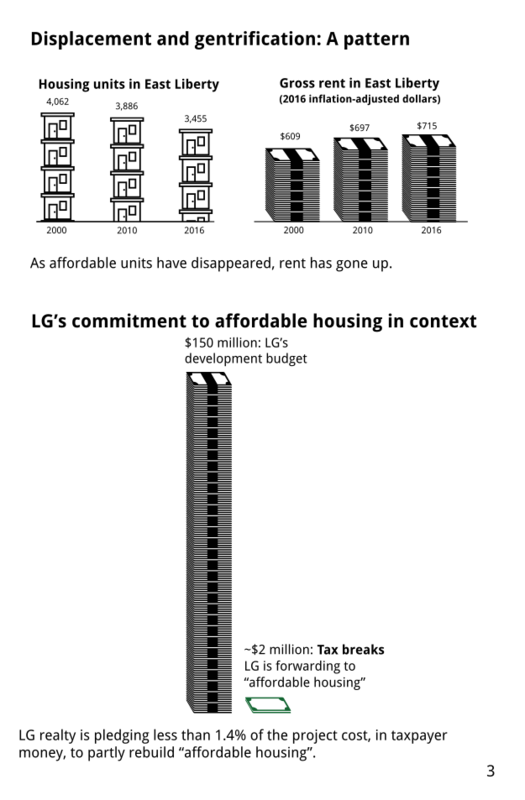 LG Realty's evaluation of social impact does not address these negative effects at all. 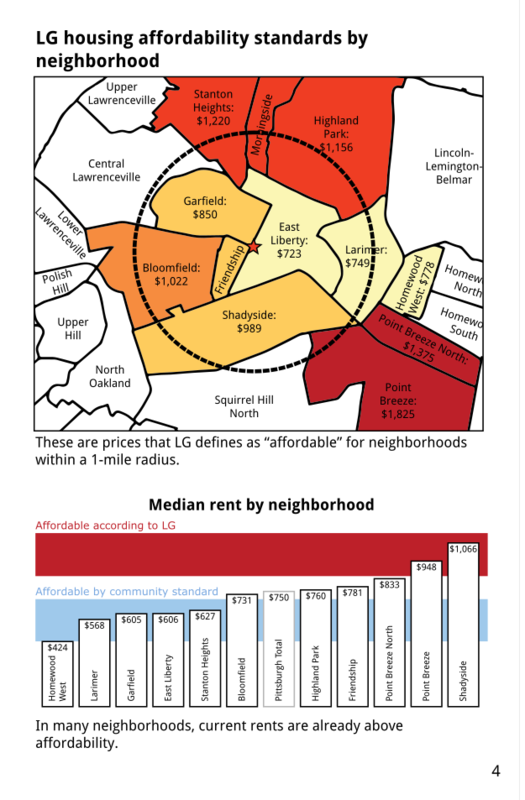 Affordable housing is a problem, not just in East Liberty, but throughout Pittsburgh more generally. The plan put forth by the consent order does NOT contain sufficient guarantees that money will go into housing actually affordable to East Liberty or former Penn Plaza residents.